Can you believe that it is Autumn already! This time of year is perfect for exploring nature as we run through the fallen leaves, search under rocks and stones for bugs and slugs to be found and enjoy the mid morning to mid afternoon sun shine. We have a lot planned this term with an exciting trip to Mega Air next month and then off to an Artisan Bakery for some morning tea. We would also like to welcome three new educators, Elena, Laura and Vanessa. We have changed the way we review our policies. Each month we will post up on our family Facebook page what policy we are reviewing with a copy of the policy. Most of our policies are reviewed every three years with some needing to be reviewed annually and we would love your input into this process, your time reading and offering suggestions is appreciated. We have recently passed our first Audit… YAY!! One aspect that was mentioned was our sign in sheets. Please ensure you are writing the actual time you drop off your child and the actual time you pick them up, along with signing the form daily. Please also note that our home educators have life events outside of their work hours, please be conscience of this and adhere to your booked hours. With winter soon approaching we like to revisit our policy surrounding sickness. Please keep your child at home if they are unwell, if you are unsure give your educator a call to discuss with them and decide together if attending will benefit your child or if a day at home is what is needed. If you child has had vomiting or diarrhoea please keep them at home for 48 hrs after their last episode. Outside play in winter is important for maintaining a healthy immune system. Please ensure gumboots, jackets and hats are provided daily for the children to continue to play outside. We have added an extra wellness page to this newsletter for some tips to staying healthy this winter. We have two professional development opportunities on offer this term. One is surrounding healthy eating through Nourished Beginnings. Nourished Beginnings provide nutrition and whole food professional development training for ECE services throughout NZ and Australia. The other one is a course through Child Matters. Child Matters is a National Charitable trust. They work throughout New Zealand, educating, supporting and inspiring adults to protect children. We are continually striving to provide great learning opportunities for our educators to grow and learn and for your tamariki to benefit from their new learning. “Whaowhia te kete matauranga” – Fill the basket of knowledge. 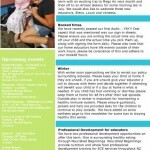 Click this link to download our newsletter.